Sam Cook and his wife, Sherry, are making gifts toward outreach and support of diversity in the College of Natural Resources. Forestry has been Sam Cook’s life’s work. But if not for a suggestion from his older sister decades ago, he may never even have learned the field existed. Cook was an Alabama high schooler in the late 1970s when his sister told him she’d heard about an interesting program at Tuskegee University, where she was a student. He could start studying at Tuskegee, she said, then transfer to another accredited university to complete a degree in forestry. Now, he is using the power of philanthropy to open other students’ eyes to forestry and NC State. 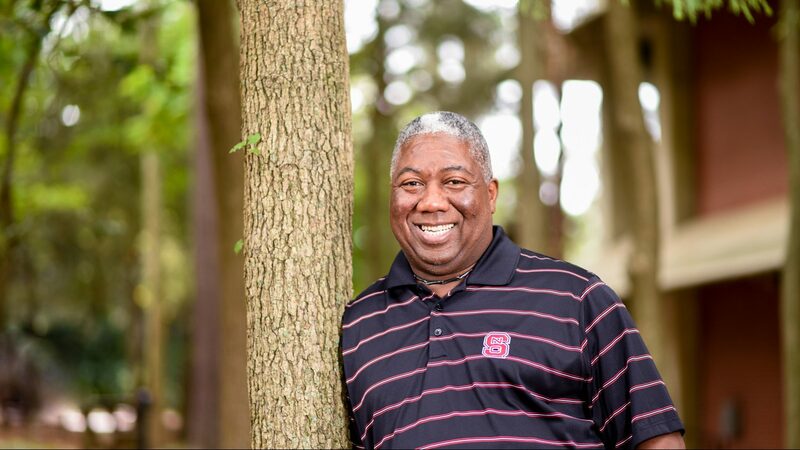 Cook and his wife, Sherry, recently established two funds to support the college’s recruitment of forestry students from underrepresented groups. According to the Bureau of Labor Statistics, African-Americans make up roughly 9 percent of the total forestry and logging workforce. In fall 2017, 4 percent of forestry and environmental resources students at NC State were African-American. That’s a sizable increase from the previous 10 years, when African-Americans made up roughly 2 percent of the forestry student body, based on data from the Office of Institutional Research and Planning. Cook attributes those disparities to a lack of awareness of forestry among African-Americans. His philanthropic gifts extend work he already does to make sure minority students know about opportunities in the field. And Cook knows those opportunities well. After graduating from NC State in 1984, he went to work for the U.S. Forestry Service. Over the next 30-plus years, he worked for Duke Power, International Paper and forestry-related nonprofit organizations in South Carolina. Cook also served on the College of Natural Resources Foundation Board of Directors during his career. Cook credits his mentor, associate professor emeritus Larry Jervis, with opening professional doors for him as a student and after he graduated. “My way of giving back was to stay close to him and stay close to the foundation side of the world and participate,” Cook said. In 2016, Cook took on his current role. As executive director of forestry assets, he oversees 10 forest properties that support research and generate more than $3 million annually for the college. Cook is also the liaison between the foundation, the NC State Board of Trustees and the College of Natural Resources Foundation Board. And, by recruiting and mentoring students, he carries forward the work Jervis did with him. One of those students is Kenneth Dunn, a first-year master’s student from Durham. Dunn spent much of his childhood in the woods and studied environmental engineering as an undergraduate. But he never considered forestry until meeting Cook during his junior year, at orientation for a Conservation Trust for North Carolina program. Over the next few weeks and months, the two met regularly, and Cook sold Dunn on forestry. He hasn’t looked back. Cook and Dunn keep in touch through weekly check-ins that touch on forestry, family and anything in between. This past summer, Cook helped Dunn get an internship with a South Carolina law firm that focuses on legal issues related to forestry. The experience set the template for what Dunn hopes to do after graduation: find a career where the human and technical aspects of forestry come together. Odds are, Sam Cook will keep helping him – and other prospective forestry students – find the right path. Support NC State and CNR students today.